I recently had the privilege of meeting Larry French, CEO of Griffon Aerospace (also see Wikipedia’s article on Griffon). He is an inventor, an entrepreneur, a pilot, and the brains behind several major product innovations, including the Lionheart 6-passenger airplane and a host of unmanned aircraft that are disrupting the aviation world with their high performance at very low cost. 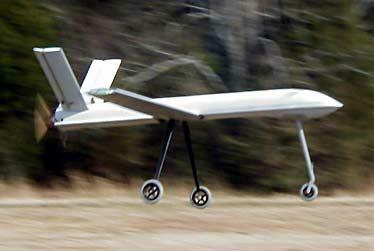 Griffon has made news recently with the success of its unmanned aircraft. These drones are playing increasingly important roles in military actions around the world and help save many lives (for the forces deploying them). The Broadsword, for example, is a large unmanned device that can carry numerous sensors and other devices to assist the military in many operations. New contracts have come in for that. They also recently won a 5-year contract for the production, maintenance, engineering and flight services for the Remotely Piloted Vehicle Target (RPVT) program. Their bread and butter seems to have been the Outlaw™, a 120-lb gross weight air vehicle that can carry 30 pounds of payload. If I understood correctly, they can manufacture and sell this aircraft for a about 1/5 of what their competitors have been able to do–a remarkable cost benefit that stems from vigorous innovation on many fronts. Larry began as a pilot and an inventor, creating efficient airplanes like the Lionheart in 1994. In 1994 he founded Griffon Aerospace to pursue the unmanned aircraft market. Keeping his operations close to him, with tight control over training of employees, materials, processes, design, and manufacturing has helped him to innovate across the supply chain and at all levels, resulting in significant cost reductions and competitive advantage. Griffon is based in Madison, Alabama (near Huntsville), where the launch of the 500-lb BroadSword was recently heralded by the Madison Weekly. Larry’s journey as an entrepreneur and innovator has required that he face and overcome many of the innovation fatigue factors we describe in Conquering Innovation Fatigue. The ever-changing burdens of government regulation can be discouraging and expensive, for example. But he has found ways to cope, painful as it can be. The early years were truly difficult and required a lot of faith to keep the business alive. Now it is highly successful with over 50 employees and a bright future with valuable products that are changing the way we approach war, with far less risk to human pilots and crews. They can thank the pilot behind Griffon, the visionary innovator, Larry French. For me I’m a “build it and they well come” business guy. I initiated and sustained the Lionheart development and marketing on 90% passion and 10% personal/investor funding. Without that 90% passion I would not have attracted believers willing to give me some of their money. Same with our current next generation of UAVs. The UAV market is in its infancy which means there are so many diverging opportunities that trying to select which of all the potential doors a winner is behind is nearly impossible. So, after reasonable absorption of the market trends, I follow my passion for the next aircraft. Fortunately now, unlike 10 years ago, I have the resources (passion, people, facilities, and finances) to convert idea to product. Innovation never stops at Griffon. One of the next challenges on the aviation horizon is the heavy fuel engine, an engine that can burn heavy fuels such as diesel fuel or biodiesel instead of the lighter aviation fuel that can be so expensive in foreign theaters. (One energy expert told me that the delivered cost of aviation fuel in Afghanistan is $600/gallon. Wow. With diesel, local fuels could support the aircraft engine and greatly reduce costs. As heavy fuel engines emerge, I expect to see them used successfully by Griffon Aerospace, with their own added inventions. While flying to Denver recently, I met Nick Davis, Regional Executive Chef for Whole Foods out of Colorado. He handles Whole Foods cuisine for a large portion of the West. Nick has been a champion for innovative offerings based on street foods, and has been approving new products and developing recipes based on the successes of street food. In my experience, the street is where some of the heartiest and most economical food can be found, and Nick agrees. In Mexico, for example, it’s hard to beat the street for flavor and value, with marvelous Oaxaca-style tamales being among my favorites. Street food can be fabulous in the States as well. Crème brûlée in San Francisco is a popular street food, for example, that Whole Foods is bringing to some California stores. Several Whole Foods locations such as the Trolley Square Whole Foods in Salt Lake City are offering “street eats” as a restaurant-style service in the store as well as street food packages you can take out. Nick has been working on the menus for these products. Kudos to Nick and all the innovators at Whole Foods for recognizing the need to bring the street into the store. One more example of innovation based on understanding consumers and trends. Whole Foods is a great place to go for market research in addition to enjoyable, quality food and other products. One can learn a lot about green packaging trends, innovations in flexible pouches, self-care products, organics, ingredients, and international cuisine. Did you know that carpets can be recycled? The typical carpet has nylon fibers and a polypropylene backing. Thanks to Dr. Chris Roberts in the Chemical Engineering Department at Auburn University, there is now a clear, simple, practical way to extract pure nylon powder from used carpet. The remaining polypropylene can be used as well. The technology developed by Dr. Roberts was patented, and the patent estate became the basis for a start-up company, Modular Carpet Recycling (MCR). The elegant process is described in U.S. Patent No. 5,994,417, “Process for recovering polymers from commingled materials,” issued to Christopher B. Roberts and Aron T. Griffith, Nov. 30, 1999. Formic acid, the compound that provides the sting of ants and stinging nettle, is used to dissolve the nylon. The solution is then injected into a chamber with supercritical carbon dioxide. Formic acid remains soluble in the carbon dioxide but the nylon precipitates out, forming a fine powder. The pressure of the carbon dioxide can then be lowered to take it below the supercritical state which causes the formic acid to separate from the carbon dioxide. Both materials can then be used again. Simple, clean, efficient. Another group recognized the value of what Dr. Roberts had created and worked with him to commercialize the technology, creating additional intellectual property in the way to bring the technology to an industrial scale. The polypropylene backing of the carpet, after the nylon has been dissolved away, is also recycled. It can be used to make laminated board materials, for example. As with most inventions, there is a need for others to contribute further advances to bring the invention forward to the point where it becomes commercial and has impact on society–in other words, to turn the invention into an innovation. Partnerships between industry and universities are increasingly important in solving real world problems in ways that change society (and make real money). And once again, having a patent made the partnership work. Without it, there would have been no motivation to work with the university and less incentive to take on the risk of commercializing an unprotected technology. It’s very basic, but worth repeating: patents can help create partnership opportunities. Patents can make it more likely for research to result in commercially important innovation, not less likely.